"You have to hear his voice! Traditional Hawaiian music at its finest. Listen to the future of Hawaiian music; listen to Kai!" "Mahalo nui loa for the CD from the awesome young Mr. Smith! I haven’t stopped playing it yet." "Kai’s falsetto is a welcome arrival on the Hawaiiana front  a lad of today perpetuating a tradition of the past. If you savor the glory and gusto of falsetto, this one’s a must." Eleven songs plus opening chant bring listeners the sound and feel of the Hawaiian community of Hana, Maui, from its native son Kaiolohia K. Funes Smith. Kais lovely vocals and classic Hawaiian falsetto are accompanied by his ukulele and guitar, with support from outstanding guest artists: Cody Pueo Pata on backing vocals, Vinton Castro on guitar and steel guitar, Ata Damasco on piano, and Leimana Abenes on upright bass. Kais younger sister, Pua, is featured on Nani, singing with a purity and innocence reserved mostly for angels. Several of the songs are Hana- or family-specific (Waikaloa, Nahiku, E Mililani `O Iehova); others are traditional favorites rarely recorded today (Ku`u Milimili, Nawiliwili); and a handful are Kais own compositions, new songs with a traditional feel. Each reflects Kais sound, identifiably Hana but uniquely his own. In the opening chant, Oli Aloha No Kaiolohia, performed by Melody Cosma, one feels the love and support the Hana community feels for Kai and its wishes for his future. 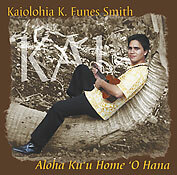 Aloha Ku`u Home `O Hana was recorded as Kai completed his senior year at Hana High School. It was, of course, Kais wish to make the recording in Hana, but he graciously agreed to bring Hana just down the road to Ulu Loa in Ha`iku. For this, his producers are both proud and grateful. So welcoming and delightful are the many natural splendors of Hana, Maui. Sitting on the porch overlooking the black pebbly beach of Ka`ili`ili o Waikaloa and the slopes of Ka`uiki, Uncle John Pi`ilani Watkins composed this beautiful mele, which he dedicated to the Malaiakini family for their warm hospitality and generosity living there at Waikaloa, Hana, Maui. “Puna paia `a`ala i ka hala.” Famous is Puna for its beautiful groves of hala. Written by Uncle Johnny Lum-Ho, this song speaks of the hinano blossom and of the many ways to use the dried lauhala. Nahiku is a little village between Hana town and Ke`anae. This song, written by one of Hana’s old-time musicians, Uncle Matthew Kalalau, talks about the sweet fragrance of the yellow `awapuhi (ginger) flower growing by the side of the road. “Majestic is Hale`iwa” where stands proud a famous hotel on the North Shore of O`ahu. This beautiful composition explains the beauty in someone you love dearly; may they be the nearest to your heart, and always your own. It features the voice of Lorraine Puanani Funes Smith. Kaiolohia wrote this song in honor of two lovers who were far apart but could share the moon at night. One of Hawaii’s famous falsetto singers, Uncle Bill Ali`iloa Lincoln, wrote this song, which talks about the sweetly fragranced lei which he adored and held closely to his thoughts. This mele speaks about the famous Nawiliwili harbor on Kaua`i and that isle’s sweet-smelling mokihana berry. This mele talks about the sacred glow of the crimson-hued clouds in the sky. Kaiolohia wrote this song for his newborn nephew Michael Kawena`ulaokeaokulani Smith Kalalau. The kupuna of Hana say that Honokalani was the land where the chiefly families descending from King Pi`ilani lived. This mele written by Hana’s own, Aunty G-Girl Keli`iho`omalu, reminds us that God is with us always.